NU Votes volunteers speak to students at a voter registration booth. A national study showed Northwestern students had above average rates of voter registration and turnout in the 2016 election. Student voting turnout and registration increased significantly at Northwestern compared to other universities over a four-year period, according to a national study of student voting habits. The National Study of Learning, Voting, and Engagement data showed Northwestern had an increase of more than 15 percent in voting turnout from 2012 to 2016. Nationally, the average increase during that same period was about 3 percent. Rob Donahue, associate director of the Center for Civic Engagement, told The Daily he attributed much of that increase to NU Votes — a CCE initiative that encourages voter engagement. Also, 91 percent of eligible voters were registered at Northwestern in 2016, compared to just over 70 percent at other universities. This September, the eligible student registration exceeded 96 percent, according to NU Votes. Northwestern was still above the national average when it comes to actually going to the polls, with 64 percent of eligible students voting compared to 50 percent elsewhere. “Now is a particularly pivotal time for the youth electorate to think about the impact they stand to make if they start paying attention in not just presidential, but also in midterm (elections),” Donahue said. 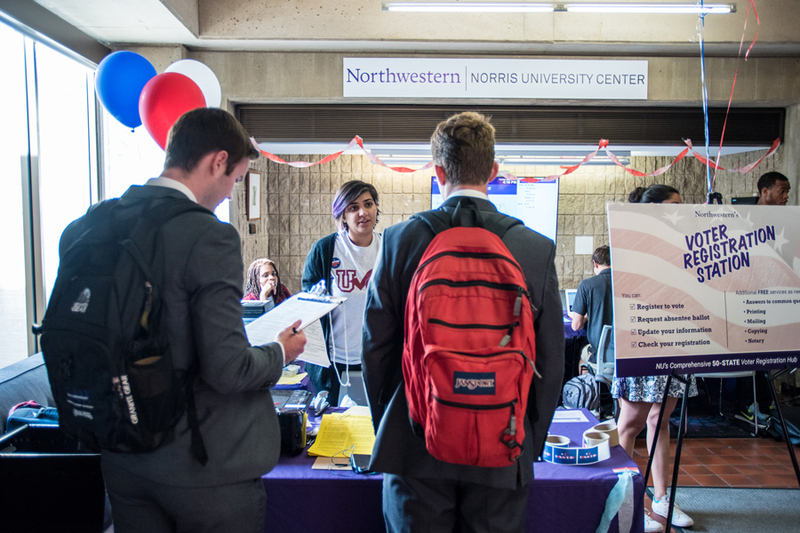 With this increased involvement, Northwestern is one of nine top universities for voter engagement out of over 1,000 studied, according to an Institute for Democracy and Higher Education at Tufts University report using the NSLVE data. On Oct. 19, the University was recognized for its voter registration efforts when it received five awards from the ALL IN Campus Democracy Challenge, a national challenge to colleges to promote civic engagement. NU Votes and the CCE employ several different strategies to elevate participation, said Lauryn Schmelzer, a CCE fellow and NU Votes steering committee student representative. Schmelzer told The Daily that NU Votes has voter vans to transport students to the polls and a registration station at Norris University Center before big elections. Schmelzer said each state has a different registration and absentee ballot process, but NU Votes can help make those options available to every eligible student. Donahue said NU Votes also has some online resources for states that offer online registration, but there may be different requirements by state, so it’s better to visit NU Votes in person. This fall, Donahue said Northwestern will participate in the Big Ten Voting Challenge in the Big Ten Conference to see which schools have the most registered and voting students during the midterm elections. He said he thinks students will increase turnout this year, although average midterm turnout is around 20 percent at Northwestern.